Note: I had written this originally for my running clubs newsletter in December 2013 but was not able to keep the word count close to the required <750. I always loathed running after being constantly forced to do wind sprints and laps while playing club lacrosse in college. Yes I ran some on and off in my 20’s and 30’s in an attempt to control my weight but It wasn’t until 2009 when some friends from San Antonio challenged me to run a half marathon with them that I ran more than 4 miles at a time. I endured the beat down of training alone but after I bested my friends in my first half marathon the running bug had bitten me. The night before that race they had told me about how the wife had qualified for Boston but gotten sick the week before and had a terrible race. The imagery of their description of the Boston Marathon itself intrigued me. I continued to run and as my times got faster thought I might have a chance to qualify for Boston the following year. The sheer thought of running more than 15 miles scared the crap out of me so I decided I would run two marathons in my life, Boston and the one to qualify for it. In 2010 I qualified at White Rock. I’ll never forget emotion and tears as I ran the last miles thinking after all that training I had accomplished the goal, then calling my dad who at the time was in the last months of his battle with cancer and sharing the joy with him. BQ’ing is incredible, and the emotions you go thru the first time after training so hard, thinking you have a shot but still having that doubt, and finally achieving it are not describable. I have a friend Trisha, that used to run with the Lifetime Fitness run group I run with on weekdays. She is pretty fast and once beat my buddy Dave Chase and I at the FW Labor Day 15K. Watching her you would never know she was fast, as she has cerebral palsy on her right side. Her gait is a mess and if you run on her right side she will whack you with her right arm on every stride as she has little control over it. I have always been amazed how she is able to live her life as the mother of two small children, wife of a Doctor in residency, work as a travelling podiatrist, and still be able to run with us, much less with a handicap. 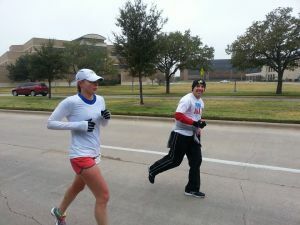 In 2011 she wanted to BQ at the Dallas Marathon. I had already registered for the half so I was going to run her to the half split at mile 9 and Jack Hase was kind enough to pick her up at the LGRAW aid station and run her around the lake until I could finish, drive over to mile 20 and run her in from there. She was right on pace until mile 20 but the Dollys’ took their toll on her and she began to struggle. I was trying to get her mind off the pain so we (mainly me) sang songs together ( I know few words so there was a lot of humming) and made remarks to keep her mind off the pain. At about mile 23 it was clear we weren’t going to get to her time. About then she shocked me by saying “maybe they will let me in because I am handicapped”. I told her I couldn’t believe she said that because I had never heard her say that before or even consider herself handicapped. She ended up running a 3:43, 3 minutes short of her BQ time. I might have been more crushed that she missed it. A friend I swim with also wanted to BQ. He had trained plenty and was strong enough to run the 3:25 he needed. I agreed to run with him at Houston in 2013 although I had been having foot issues and was not sure I could stay with him to the finish. He left me at mile 13 when I had to stop at the portolet. I thought he was on his way to his BQ because we were running below 3:20 pace at the time and he was running strong. At mile 20 I caught him and he was clearly struggling. I went thru the kitchen drawer of things to say to motivate him; then I started to deride him brutally. I stayed with him until mile 23 and was getting growing impatient of walking with him. I still had to BQ myself so he told me to go ahead. I made my time, but the fact that he did not made the race bittersweet. We tried again at Cowtown the next month. He was running the full, I ran the Ultra so the plan was for me to stay with him to 25 until the course split. I made it until 18 but could not keep the pace so I told him to keep after it and he was going to get it this time. He ended up cratering at mile 22 and failed to reach his time once again. Damn I thought, I must be bad luck. I have this other friend I swim at the lake with on Fridays. She is usually the only girl with a bunch of guys but considered one of us. She is one of the most cheerful, playful, tenacious athletes I know. She is also part of this crazy FIGJAM club that I have come to appreciate by how much they support each other at races and events the others are participating in. Of course you all know her as Drum. She had told me about her quest to BQ about a year ago. She is also superstitious for some reason and likes to keep her goals and races on “The Down Low” or at least that’s what she tells everyone. 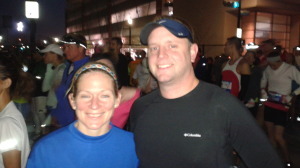 After a big PR at the secretly run Army Marathon, Dallas was semi-secretly going to be her BQ race. I really wanted to offer to pace her but physically I was unable to run more than 6 miles much less at the pace she wanted due to a freak accident I had earlier. 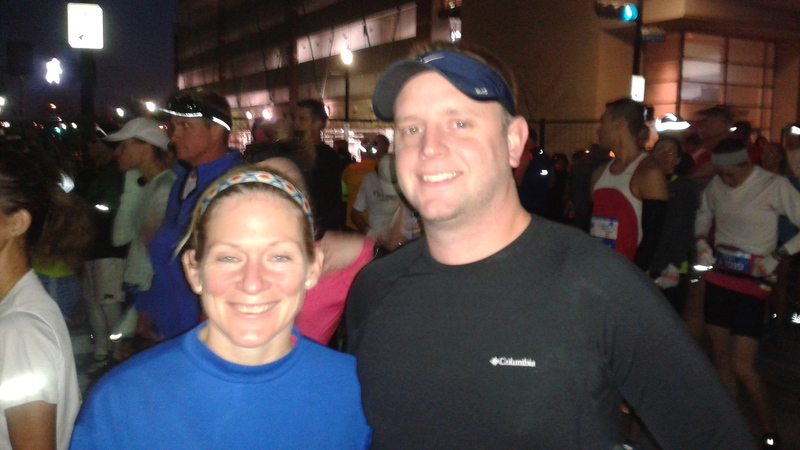 A couple of weeks before the big Dallas race she told me another FIGJAM member, who looks like a hairless leprechaun and speaks with a funny Cajun accent (let’s just call him Byron for literary brevity), had gotten hurt and was not going to be able to run with her for the final part of the Dallas marathon. I had recently made some good progress with my injury so I told her if I could run I might be able to pace her. The next week I went for a run just to see how long I could maintain 8:00 pace and how high my HR would go since I had gotten myself into “Kannady” shape. I was able to pull off 7 miles so in excitement fired off a text that I would be good for 6 miles if she wanted any company. I did not tell her about my abysmal track record trying to help people BQ. She told me she would be glad to have me run along so the plan was set to pick her up at mile 17 after working the LGRAW aid station and get her to at least mile 23. Finally! I was going to get another opportunity to help someone experience the joy of first time BQ. A few days out it looked like the temperatures would be very cool, perfect for a fast marathon, but that forecast quickly deteriorated into what is now known as Icemageddon 2013. When I first heard of the Dallas Marathon cancellation I thought of Drum and texted her “I’m sorry”, I knew she would be crushed. I checked the marathon guide and saw the BCS marathon was scheduled for the same day but was sold out I messaged her she might want to email the race director to see if there was any last minute room. Later I saw they had opened up additional slots and shared that with her. Byron rightfully thought it crazy to try to drive thru the ice to try to get to College Station for the race. I was just throwing out options knowing how bad it hurt to train hard for a race and have it cancelled at the last minute (happened to me at NYC 2012). Then I thought what am I doing I was supposed to run with her in Dallas, is she going to expect me to run with her in College Station? A text from Byron aggravated this guilt more teasing me that I would have to go to College Station if she signed up for the race. Saturday morning I found out she had signed up for the race, then later was not going to go because there was too much ice and her husband was not feeling well, and next that she was on her way. Later that morning a close friend from Detroit called to say he was stranded in Dallas because his flight had been cancelled and he was here until Sunday morning. Shoot, how am I going to get to College Station? I thought. I did a few calculations, the race started at 7:00, if I left at 4:30AM I could get down there about 8:30 depending on how far the roads were in bad condition. Not the fool to do the drive myself I told the “half believing” Byron I would be picking him up at 4:45AM. I knew he wouldn’t say no, the word “no” is not in his vocabulary. So after staying up until midnight with my buddy from out of town I woke at 4:00, got on the road and picked up Byron. The roads had refroze that night and the conditions sucked. I told Byron we were going as far as Corsicana and if the conditions didn’t improve we would turn back. We arrived in College Station about 8:30 and after figuring out which way was up on the course map navigated to a parking area near mile 16 where we thought we might be able to catch Russ and Jay running by and then I could start running with the “surprised to see us” Drum. Just as we walked up to mile 16 we saw Russ’s familiar running style (later named “Tigger” by Barney) as he passed so we thought we would see Jay next. Jay was a few minutes behind and I yelled he needed to run faster to catch Russ. Based on an 8:00 minute pace Drum should be there about 9:08 so Byron jogged a few hundred yards before the 16 mile mark and when I saw him running back I knew he was accompanied by Drum. At 9:11 I started jogging slowly with the other marathoners waiting for her to pass and heard a familiar “you better start running faster old man”. She wasn’t on 8:00 pace like I expected but she wasn’t that far off of it and I thought BQ was cake if we could keep her going. I asked what corral she started in and she knew what I was asking and said she started about a minute behind the gun. Note to self, this is a huge deal. Do not rely on a runner running without a watch to know chip/gun time differential. So I’m thinking get her in before 10:41 and it’s a BQ. BCS has a lot of turns so I knew running the tangents was going to save big time on this course. My goal was to direct her to the tangents so she didn’t have to think about them. We were running with another marathoner doing the Galloway method whom Drum had been having conversations with earlier mostly talking about how I was the idiot running too much because I was injured, after a few miles of this I told her to stop talking because she was clearly disrupting her breathing to speak. Thereafter I did most of the speaking and got limited response to questions and wasn’t quite sure if it was because I told her to stop talking, or she was pissed at me for telling her to stop talking, or she was hurting and didn’t want to talk. Mile 16 and 20.5 are at the same corner so at mile 20 I told her we would be seeing Byron again shortly which drew a big grin on her face. Sure enough about a quarter mile away you could hear him yelling. I gave him thumbs up as we ran by because at that point we had been running about an 8:12 pace. At each mile marker I pulled out my phone calculating where we would be if we maintained a 8:30 pace. What I failed to realize even though I had a stupid Garmin clocking each mile, is that our pace was creeping over 8:30 pace after mile 20. I kept calculating after every mile and I knew it was getting close. At the same time Evan, Drums husband who was riding along on a mountain bike was telling her how she was doing in different terms and I wasn’t quite sure if I told her we were getting close would be contradicting what he was saying. I think it was about mile 23 when I said we need to pick up the pace and she responded she already had. I continued to recalculate at each mile marker thinking we had 1 minute difference between chip time and gun time. At about 1.5 miles left she asked if she was going to make it. I told her she was knowing it was going to be only by about 30 seconds and she showed a grin. I let her know when a mile was left, 1200 meters, 800 meters, then there was that hairless Cajun leprechaun’s voice again, screaming “come on Drum sprint” and all sorts of other stuff I couldn’t understand because I don’t speak Cajun. She picked up the pace ran down the chute, while I peeled off outside the barriers, and crossed in what I saw was a 3:40:26 gun time. Then I had a sinking feeling. Did I really hear her say it took her a minute to cross the start line or did she say 10 seconds. I went over to the timing tent and saw they had a link posted for online tracking. I punched it in on the screen of my phone that had already been messed up with gatorade, water and sweat and couldn’t get any results. Finally after what seemed like 10 minutes of trying to get results on the phone I walked over to the timer and apologized for bothering him but could he give me a time. Then we had about a 3 minute conversation about how I didn’t know my bib number because I didn’t want my time I wanted someone else’s and the phone app wasn’t working. So he tried it on his phone and said “shoot when did that stop working”. He then went to his laptop and after I had to spell out B-L-A-C-K-A-R-D about 5 times he said 3:40:23. “Chip Time” I might have screamed. He looked again and said 3:40:00. Shoot! I thought to myself that’s not enough, BQ is better than 3:40:00 isnt it? What happened to the 1 minute chip/gun time differential she told me about? Rush of emotions, I can’t believe I failed again, how the heck was Drum going to handle this? I needed to be sure. I went to the BAA website on my sweaty, Gatorade sticky phone and looked for the qualifying times. Nowhere did it say better than 3:40:00. It just said 3:40:00. I ran into Byron and we huddled on this and were worried that the extra 10ths of a second might put her over. I was so engrossed in this for so long I never had the chance to go give Drum a hug or congratulate Jay and Russ on their awesome times. We finally decided that if the race results posted 3:40:00 it must be a BQ. I honestly never thought it would be a question of minutes much less seconds. I thought she would smoke her BQ time by 5 minutes so I was not prepared to shave every second possible. I’m thankful for Byron yelling so much near the end of the race to inspire her to sprint to the finish. Had he not it might have been 3:40:02. And most of all I am thankful for my pal Drum for showing that tenaciousness, fighting thru the quad pain that she never told me about, to get her BQ and redeem me as a legitimate BQ pacer. 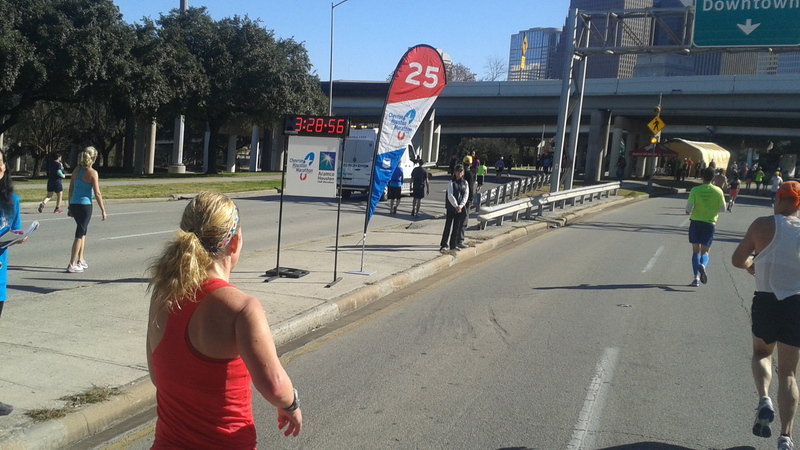 Two weeks later my friend Trish told me she was giving it another go at the Houston Marathon. I told her I was still out of shape but would run with her as long as I could. Her husband Chris ran with us to about mile 16. She was holding a great pace and at mile 18 I told her I thought I was going to drop. She yelled at me that I couldn’t because she needed me there. So I sucked it up and did my best to keep up with her. 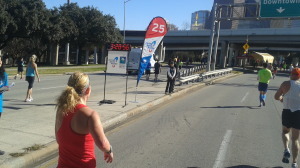 A little before mile 25 I calculated in my head she had about 11 minutes to run the last mile and still BQ. At mile 25 I told her I was dropping so she could enjoy the emotions of the last mile by herself. Then I yelled at her “keep up the pace and don’t screw this up”. I found her at the finish line after I crossed. She had bested her BQ time by 2:30. I was obviously elated!